PTFE (or polytetrafluoroethylene) was discovered by Dr. Roy Plunkett while he was working on a project regarding refrigerants. While checking a frozen, compressed sample of tetrafluoroethylene, he noticed the sample had polymerized itself into a white, wax-like solid that he referred to as "polytetrafluoroethylene." After the discovery, DuPont engineers began converting the PTFE Fabric into blocks, which could be molded into intended shapes. After some time, aqueous dispersion was developed, and then powder grades in order to extrude tubing. In current times, some manufacturers use PTFE to produce products, while others implement it as a contribution. Automotive - PTFE is used as a component in vehicles where over-braided hose constructions are used for air brake systems. PTFE has a high-temperature tolerance, so it is implemented into the outlet side of air compressors. In addition, the fluoropolymer helps to minimize the carbon particle deposition. Aircraft/Aerospace - PTFE is used for aircraft fuel, hydraulic hose, and tubing hoses over braided with Kevlar. In addition, it is implemented to facilitate medium pressure and to temper heat in fuel, oil, and water/alcohol in hydraulic and pneumatic systems. Chemical processing - PTFE is used in relation to chemical transfer hoses, flexible connectors, product interchange lines, and flexible hoses for process lines, steam lines, and refrigeration systems. In this industry the fluoropolymer, PTFE, is recognized as an advantage over stainless steel, corrugated hoses. Pharmaceuticals - Supplied with an over braid, PTFE offers a strong and easy purging and cleaning system to meet those imperative demands of the industry. Cryogenic - PTFE stays tenacious under cryogenic conditions, so it is celebrated in the industry. 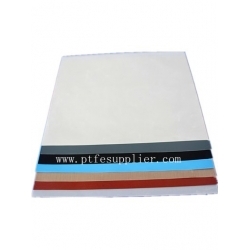 PTFE is an optimal fluoropolymer to use in liquid air systems, fuel lines, hydraulic hoses in jet aircraft, and in piston rings.